FAQ: What’s that line on my Envelope bar? EEBA is now Goodbudget! Goodbudget has all the great features of EEBA (and more!) in a new and updated interface. Check out our updated article on this topic, and check out the Goodbudget Help Center for the most recent help content. What is that? And how can it help me keep a budget? On Android and iPhone, your Envelopes are represented by a green bar with a line that crosses through it. The green bar represents the funds you have left in each Envelope. When the Envelope is full, the bar will be fully green. 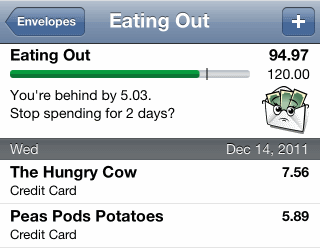 As you spend out of the Envelope, the green bar will decrease to the left. The line represents where you would be if you were “on budget.” For example, the Eating Out Envelope above has a budget of $120, and is five days into a monthly budgeting period. Assuming there are 30 days this month, that budget of $120 works out to about $4 a day (120/30 = 4). So, five days into the month the line would show where the green bar would be if you spent exactly $20 (4 x 5 = 20). Unfortunately, this Eating Out Envelope has $25.03 in expenses. That means the Envelope is “behind” by $5.03, that’s the difference between the Envelope’s actual balance, and its theoretical on-budget balance. If the pace of spending from this Envelope continues, it will go into the red before the end of the month. What to do when you’re behind? So what can you do if you’re behind the little line? Being behind may not always be a problem. The little line assumes your spending will be consistent during the month, but this may not be true for you. If you spend more at the beginning of the month than at the end, you’ll likely be “behind” after the initial rush of spending. Wait for the month to end to see if your overall spending for the month still matches your budget. If you’re behind in a discretionary Envelope, use some discretion and choose not to spend! Choose to live into the budget you’ve set for yourself. If you can’t cut back, then it may be time to re-evaluate your budget. This isn’t a bad thing. Life brings change, so give your budget the freedom to change with you. By comparing your actual spending to where you “should” be, you’ll be able to track your spending on even the busiest of Envelopes. I have EEBA on my iPhone, but don’t see this little line – how can I get it? If you’re using an iPhone 3GS or older, the Envelope bars will look a little different. The ahead/behind line will appear as white, which may make them hard to see since the background is white. Is that what you’re experiencing? No, I have an iPhone 4 and don’t see a bar of any color, regardless of how full (or empty) my envelope is. Is this a subscription service feature? I told it my budget was every two weeks, but today was the two week mark and it didn’t seem aware that I was getting income again – maybe that’s why I never got a bar? Could you send a screenshot of what you’re seeing to support@eebacanhelp.com? You should see a bar, whether black (empty) or green (full) with a black line somewhere along it. If you have any other questions, let us know at support@eebacanhelp.com! I am little confused….In my budget I have my montly bills listed along with a few discretionary items…If my mobile bill is $85.00 per month (approx), but the actual bill is $83.10, and I record a payment of $83.10, why is asking me to refill my envelope?? Sure! The line “starts” at the beginning of your budgeting period. So if you want the line to “start” mid month, just change your budgeting period to start on that same day. Good question. When you’re keeping track of bills, EEBA itself won’t know if an empty Envelope represents a bill you need to prepare for, or a bill you’ve already paid. That’s why EEBA is asking you to fill the Envelope. If you tap on the Envelope in the app, however, you’ll see a list of its transactions which should let you know if you’ve paid it this month yet or not. I get pay biweekly. The green line always disappear and I have a hard time refilling the envelopes every pay day. Are you using the latest version of the app for your phone? You should be able to pick a start date for your bi-weekly budget period, and the ahead/behind lines are based off that. If you think you’re using the latest version of EEBA on your phone, send an email to support@eebacanhelp.com with your Household Username so we can take a closer look at what’s going on.